You'll find the right gift for every occasion at Diversified Showcase. and you'll know what his happening every step of the way. Looking for new crafting projects? We have instructions for projects from placemat purses to ribbon watches. the accessories to match, the possibilities are endless! Once you see our prices you won't need to shop anywhere else. I can't believe it's the middle of April already ! It's a super simple pattern that works up literally in minutes. please visit our Newsletter Archive. Return to your house and describe what great things God has done for you. And he went away, proclaiming throughout the whole city what great things Jesus had done for him. "ANY PLACE CAN BE THE RIGHT PLACE TO WITNESS." This quote is from Our Daily Bread - April, 2005 Issue. are often referred to as The _________ _________? Corporate and personal gift service specializing in theme and custom gift baskets. Offering a gift reminder service and monthly newsletter. I'd like further information on the base ch/sc. Easier way to make a Base Chain/Foundation Row. 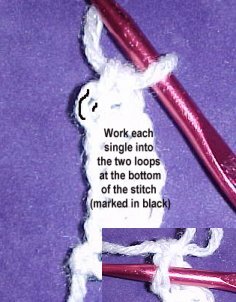 "Start with a slip knot, ch 2, insert hook in 2nd ch from hook, draw up loop, yo, draw through 1 loop, yo and draw through 2 loops – 1 single crochet with its own chain at bottom. Work next stitch under loops of that chain. Insert hook under 2 loops at bottom of previous stitch, draw up loop, yo and draw through 1 loop, yo and draw through 2 loops. Repeat for length of foundation." This is easier than it seems. This part is a bit confusing but makes total sense once you get the hang of it. working, the top of your singles are all facing your right side. The chains or foundation row is on your left. which are the two loops on the left side of the work. Now repeat this over and over until you get the number of singles you need. If you love to crochet but think it's too hot in the summer to sit with an afghan across your lap. Try choosing projects that require lighter weight yarns or turn to thread crochet for the warmer months. One great thing about a thread project is how portable it is. Just wanted to let you know that I am trying to crochet your dog sweater, and I wanted to tell you something that I found helped me. I am just learning how to crochet, and I was haveing problems with chain twisting on me when I went to join them together. So I wrapped my chain around a round container and then started to crochet the dog sweater. It makes it a eaiser in stopping the chain from twisting. RE: Feedback in March 30th Newsletter. Thank you SO MUCH for your site and your wonderful newsletter! I'm getting back into crocheting and your patterns are just wonderful. And thank you SO MUCH for all the wonderful scripture and uplifting Christian items in your newsletter. is Christian as well - i'm just thrilled!!! First thing I spotted on your page. Is Jesus Christ your personal savior. Your and to that question YES he is Ilove him with all my heart and thank him for what he has done for all of us on this earth. Love your magazine!!!! At this house we are two adult males and myself and, usually I am not the first one to read the humerous side of things, plus the religeous readings which you have. I have been wondering what the other people out there think of this "cro-tating" and has anybody tried it? What is your opinion? I have tried this "cro-knitting, but maybe I am getting too slow to comprehend it all. Till I get more information, it will be collecting dust. Have a great summer! Thank you so much for signing my Guestbook! I'm glad to hear you enjoy my newsletter. Mary's site has links to video to help you learn to crochet-tat also. Hi, These insructions rock. They are exactly what I need! It has been a long time since I knit or crochet. Two years ago I saw a scarf that I loved and I decided to knit one, then many. Next, I picked back up the crochet which I find I love even more. so I may definitely have some questions! Have a great day! I am so glad I searched the internet and found you. I did a search on knit as well and found a lady who gave me about a 1 word reply to my knit questions, so I gathered she was not so interested in helping me. Have a wonderful day Lisa! Where we offer exciting and creative projects for the home. In every issue we’ll provide patterns in a variety of mediums to compliment everyone’s taste and style. "What was Jesus' mother's name?" While ferrying workers back and forth from an offshore oilrig, the helicopter lost power and went down. Fortunately, it landed safely in the lake. Struggling to get out, one man tore off his seat belt, inflated his life vest, and jerked open the exit door. "Don't jump!" the pilot yelled. "This thing is supposed to float!" As the man leapt from the helicopter into the lake, he yelled back, "Yeah, and it's supposed to FLY too!" For all their lives, my three sons have been told they have to do their chores around the house. "I am NOT the maid" is a phrase they've heard many times. When my oldest went off to college, he called me after one week at school. Among the first words he heard at college, he reported, were those of the dormitory maid, announcing to a student who had not picked up after himself in the men's lavatory, "I am NOT your mother!" As one of relatively few female airline pilots, I've often been mistaken for a flight attendant, ticket agent or even a snack bar employee. Occasionally people will see me in uniform and ask if I'm a "real" pilot. Still others congratulate me for making it in a male-dominated field. One day, I was in the restroom before a flight. I was at the sink, brushing my teeth, when a woman walked through the door and looked over at me. "My sister would be so proud of you!" she remarked. I figured her sister must also be in the airline business, so I smiled and asked why. Replied the woman, "She's a dentist." Three little boys were bragging about how tough they were. "I'm so tough", said the first boy, "that I can wear out a pair of shoes in a week". "Well", said the second little boy, "I'm so tough, I can wear out a pair of jeans in a day". "That's nothing", said the third boy. "When my parents take me to see my grandma and grandpa, I can wear them out in just one hour." A minister was called away unexpectedly by the illness of a close family member. He entrusted his new assistant with filling the pulpit. The Pastor's wife stayed home. When he returned, the minister asked his wife what she thought of the young man's sermon. "The poorest I've ever heard," she said. "There was nothing in it, nothing at all. It didn't even make sense. It was very unorganized. I was disappointed." Later that day, the concerned minister met his assistant and asked him, "How'd the Sunday service and sermon go? Did all go well? How did you manage?" "All went very well, sir, absolutely wonderful," he said. "I didn't have time to prepare a new sermon of my own on such short notice, so I got on your computer and pulled up one of your old sermon's from last year." Becky was the manager of a jewelry store that catered to the rich of the rich in Boca Raton. She was seeking a qualified person to fill the recently vacant position of salesperson. Sarah, an outspoken older woman, comes in to interview for the position. Becky looks at Sarah's resume and notices that Sarah has never worked in jewelry before. "If you don't mind my saying so, for someone who has never worked in jewelry you certainly are asking a pretty high salary. That's chutzpah, wouldn't you say?!?" asks Becky. Sarah thinks for a moment. "Well, I suppose I am," replies Sarah, "but you must understand, the work is so much harder when you don't know what you are doing."